WRC FANS IN MORE THAN 100 COUNTRIES WILL HAVE THE CHANCE TO WATCH LIVE TELEVISION COVERAGE FROM THE STAGES OF NEXT WEEK’S RALLY SWEDEN (5–8 FEBRUARY). 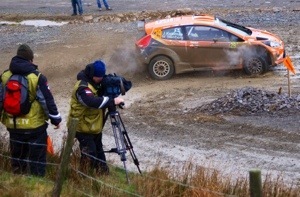 The World Rally Championship promoter has revealed that following the success of Rallye Monte-Carlo, where three hours of live coverage were produced, up to 26 live stages will be available to broadcasters this season. Three stages from Sweden will be televised live, starting on Wednesday night with the rally opening head-to-head Karlstad Super Special from 2004hrs (local time). On Saturday there will be two chances to watch the Värmullsåsen stage – which includes the breathtaking ski slope descent to the finish line. The stage will run in the morning from 1025hrs, and then again from 1513hrs as the decisive Power Stage.